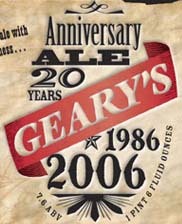 The Anniversary Ale pours a dark caramel color that presents a light-brown, fizzy head that has decent retention. As the brewery states, it has a deep chestnut color that provides a murky body that looks more edible than drinkable. Aroma is of bittersweet chocolate with astringent notes. Initial taste is absolutely loaded with bakers chocolate, providing a super velvety, bitter taste that mellows to a faintly sweet finish that, unlike the finish, is much more drinkable than edible chocolate. Light to medium bodied, it has a creamy finish with soft carbonation. Liquid chocolate on the taste, but that isn't hinted at from the aroma.